The Oregon Department of Transportation (ODOT) Regions 4 and 5 are working to create safer, more walkable and bikeable networks in and between communities across Central and Eastern Oregon, in alignment with the direction recently set out in ODOT’s Statewide Bicycle and Pedestrian Plan. Step 3. 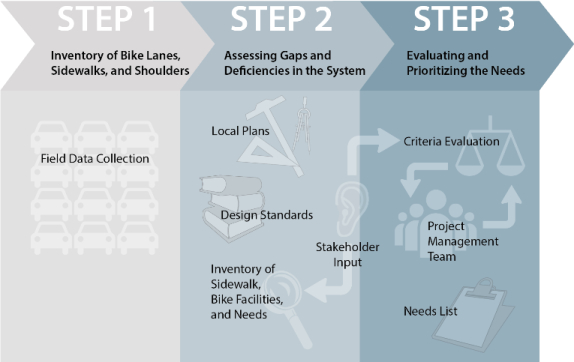 An evaluation of the gaps and deficiencies in the system using a range of evaluation criteria to help classify and prioritize the bicycle and pedestrian needs on the system. By clicking on the "Step" tabs above, you can find out more about each step of the process and where we are going. The work done to date seeks to understand the highest areas of need. Future phases will identify what facilities or designs could address the identified needs. This Active Transportation Needs Inventory is part of Key Initiative 1, Defining the Network, of the Implementation Work Program for the Statewide Bicycle and Pedestrian Plan.